Did you know that even in the Bronze Age, people wore prosthetics? The unique discovery was made in 2017 near Lake Biel in Bern, Switzerland. Treasure hunters reportedly found the prosthetic hand by using metal detectors. They also found a bronze dagger and a rib bone, which they delivered along with the hand to the Bern Archaeological Service for review. 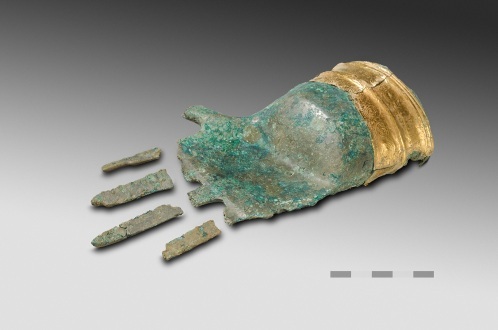 According to recent analyzes, the prosthetic hand is possibly the oldest bronze sculpture in Europe. It weighs approximately one-pound and features a gold foil cuff around the wrist. The attachment within is believed to have allowed the cast to be mounted. Radiocarbon dating was done on the glue attaching the foil to the wrist. It places the origin of artificial hand from around 1,400 and 1,500 B.C., or the middle of the Bronze Age. “It may have been this man’s insignia,” Schaer continued, “and when he died it was buried with him.” The researcher posits that the hand was a replacement for the one lost while the owner was alive. However, the prosthetic appears too delicate for daily use. It is likely that the hand was on a statue, mounted on a stick like a scepter. It also might have been worn as part of a ritual. Encouraged to learn more, Schaer returned to the site with a team. For seven weeks, they excavated the area which turned out to be a badly-damaged grave. 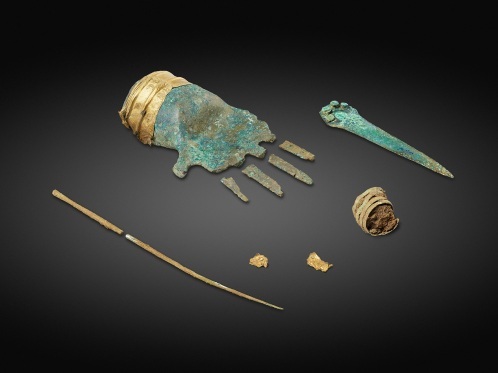 They found the bones of a middle-aged man, a long bronze pin, a bronze spiral believed to be a hair tie, and fragments of gold foil which match the fingers of the bronze hand. It was concluded that the prosthetic hand was buried with the man. The discovery is incredibly unique, as metal objects in Bronze Age burials are quite rare. Furthermore, Bronze Age burials in Switzerland rarely incorporated gold.